Based on the empty tomb in Matthew 28 v 6, this full-color leaflet for 6-12s investigates the biblical account of the first Easter. Using puzzles to fill in parts of the story, kids will learn that Jesus died to rescue us from all the wrong things we say, do and think that stop us being friends with God, and that he rose again to be King of everything. They'll also learn why we have eggs at Easter. Ideal for use in children's groups, at holiday clubs or giving away at Easter events. There are also some downloadable sheets of eggs on the left-hand side of this page - some to color-in and some to cut out and hide. We hope you have an eggcellent time! 5.6" x 5.8" x 0"
I gave this tract to our youngsters on Easter morning, a good engaging booklet and it lasts longer than an Easter egg! We were looking for resources to give out with our Easter Egg hunt, and these booklets fit the bill perfectly. Really nice and colourful with great little activities for children to do. I purchased these for my Anchor Boy group - 4 - 8 year olds, as an addition to their prize. They were excellent! Fun for the boys to read and a great way to introduce the Word of God into their homes. We bought these to give out to children at the end of a Holiday Club activity about Easter. It is an effective and helpful explanation of Easter for the 6-10 age group, though younger children may need some help to crack the code. After our Church's Good Friday Family Celebration, we attached one of these to a little bag of chocolate eggs for every child who came. This is the perfect tract for that; simple, clear, bright, cheerful, full of truth without any reason for someone to take offence. Thanks so much! We used these resources in the Good Friday craft workshop. Each child made a bag to take their crafts home in and we popped one of the books in each bag. The booklets were very popular and gave the children an opportunity to enjoy an attractive, easy to access resource. They appreciated the bright colours and the snippets of activities and information. excellent leaflet. the primary school aged children really enjoyed it but found that the older kids didn't. 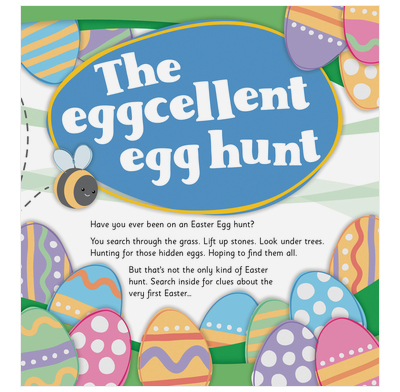 The Eggcellent Egg hunt is brightly coloured, very appealing to children. The content is very clear, and written in an engaging way. I bought this tract for my mid-week children's club for 7 to 11 year olds. I used the tract as the basis for my talk, and made a power point egg code so the children had to work out some of the answers similar to those in the tract. It worked really well, and the children were engaged. They all went home with a copy of the tract, which they could now fill in for themselves, knowing I'd gone through it with them.